Sindicato Cigars continues to bring the best together on its journey to create greatness. This time, the company is bringing hundreds of retailers and thousands of consumers together by announcing National Sindicato Day this June 14th, 2014. National Sindicato Day will be a day to get together with friends at participating tobacconists across the United States to celebrate the company’s new flagship cigar, the Sindicato. 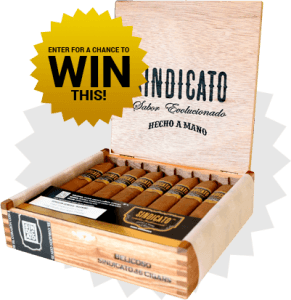 It’s well known that ‘Sindicato’ means ‘Union’ in Spanish, so to participate in this new cigar holiday, the company is urging everyone to “Join the Union” and become an official Sindicato member. By filling out your Union Registration Card,consumers will receive a Sindicato Member lapel pin, access to event deals,pre-release news, exclusive cigar tastings, and more. 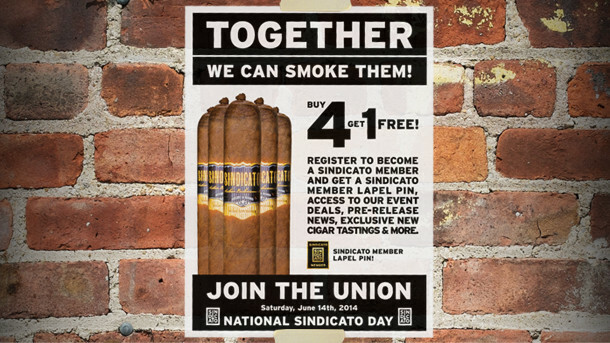 If they purchase any four(4) Sindicato cigars on National Sindicato Day, they can enjoy one(1) Sindicato cigar of any size for FREE. Jim Colucci, President and CEO of Sindicato, says “Just as we bring the best tobacco blends together, it’s now time to bring everyone together, so we can all enjoy our latest creation on the same day throughout the country. Please find a participating Sindicato retailer on June 14th, 2014 and JOIN THE UNION.